The union of two and a blissful, lasting marriage is certainly about complementing each other. And this principle can also be extended to your wedding bands. In the search for the perfect pair, a criteria to be considered, other than budget, would surely be wedding bands that reflect both your tastes and stylistic preferences. One such pair is the Yin Yang signature wedding band that is inspired by this complementary nature, whereby love is about accepting your better half, both the good and the flaws, complementing each other so that two can be united and strong as one. Made from 18K yellow gold. Yin Yang emblem inside the ring where the circle in the iconic Yin Yang symbol is represented by a diamond. This is apt as the diamond signifies strength, by virtue of it being the hardest gem in the world. It is made with comfort in mind, that is, it is convex from the inside of the ring, so that it is comfortable to wear. Designed with a certain thickness based on R&D to give you peace-of-mind, well aware that the wedding band is durable and 'tough'. 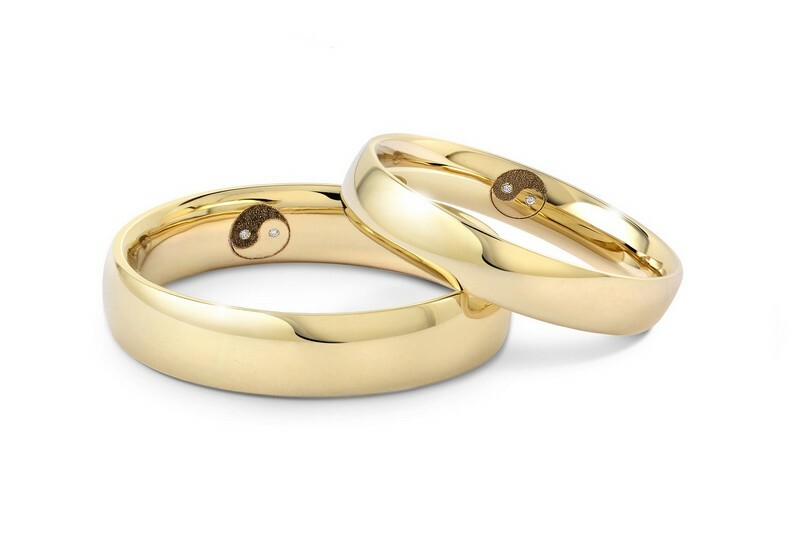 Tip : Visit Suen Jewellers to have a look at their collection of wedding bands. Contact details here.